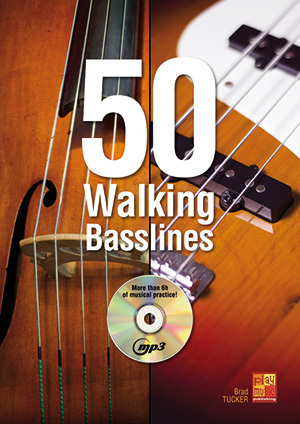 50 Walking Basslines (BASS GUITAR, Coursebooks, Brad Tucker). The 50 walking basslines comprised in this coursebook are aimed at bassists, at double bassists and first and foremost at the jazz enthusiasts among them. They will most certainly experience a whole heap of pleasure with the playing materials provided here. All 50 walking basslines are based on chord progressions that recall some of the greatest jazz standards of all time: Autumn Leaves, Someday My Prince Will Come, Giant Steps, Blues for Alice, Anthropology, Blue Bossa, Stella by Starlight, So What, Take Five, Black Orpheus, My Funny Valentine, All the Things You Are, In a Sentimental Mood, Satin Doll and Take the A Train, to name but a few! To teach you all the particularities of the 50 walking basslines presented here and eventually enable you to piece some together yourself, an entire chapter of this coursebook has been dedicated to the fundamental principles, procedures and techniques behind this type of bassline. You therewith have a realistic chance of becoming an expert on the subject. For its part, the mp3 CD is composed of as many backing tracks as there are walking basslines in the coursebook; these can be played along to at two different tempi: the intended tempo (actual playing speed) and the rehearsal tempo (slower speed). On the backing track at actual playing speed the bass is only present during the first round, then it disappears, yielding the floor to you. The backing tracks provided here are of a proper length (about 5 minutes each, which sums up to almost 6 h of musical practice). This means that you have enough time at your disposal to practice under best conditions, enough time to thoroughly internalize these 50 walking basslines and hence compose your own ones.